Durham Town Manager Todd Selig is pictured in the foreground with attorney Barry Needleman and Eversource NH President William Quinlan. Michael Fitzgerald, who is the Department of Environmental Services designee on the committee, is pictured in the background at the committee table during the second day of Site Evaluation Committee deliberations on the Seacoast Reliability Project in Concord. CONCORD – As regulators deliberate the fate of the $84 million Seacoast Reliability Project, concerns have been raised about the level of trust between its developer Eversource and property owners along the 13-mile proposed route from Madbury to Portsmouth. Patricia Weathersby, chairman of the Site Evaluation Committee hearing Eversource’s application to build the reliability project, mentioned the trust issue on Thursday while discussing Counsel for the Public’s expert Michael Lawrence’s testimony about using vegetation to mitigate the project’s visual impact on 13 properties. 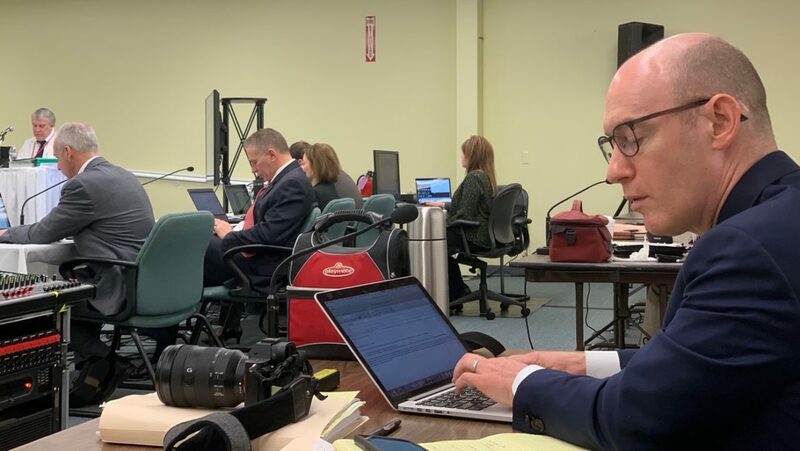 “There is a level of distrust (of Eversource) among certain landowners…,” Weathersby said on day two of the committee’s project deliberations in Concord. Weathersby said she backed fellow committee member Michael Fitzgerald’s suggestion that the applicants give due consideration to Lawrence’s comments. Fitzgerald is the Department of Environmental Services designee on the committee. William Quinlan, president of Eversource New Hampshire, told InDepthNH.org during a break Thursday: “To the extent there are issues concerning trust, we work very hard to overcome those issues. It’s important to work with landowners and communities, he said. “With a project like this, it is understandable there are concerns. It’s our responsibility to work through those concerns to everyone’s satisfaction,” Quinlan said. The seven-member committee that will decide Eversource’s application also reached consensus Thursday that the proposed Seacoast Reliability Project including mitigation plans, does not have an undue adverse effect on aesthetics, air quality or historic sites. Lawrence recommended Eversource develop vegetation planting plans for the 13 locations he identified to mitigate visual effects. Locations included: Fox Point Road Crossing, Durham Point Road Crossing, Sandy Brook Drive (east), Sandy Brook Drive (west), Frost Drive Crossing, Cutts Road Crossing, NH Route 108 Crossing, Mill Road Crossing, UNH-Gregg Hall Vicinity, UNH-Main St. Overpass, UNH-Gable Apartment Complex, UNH-Gables North parking, NH Route 4 Crossing. The committee suggested adding the Newington side of Little Bay, the Durham side of Little Bay (Getchell property now owned by Eversource), and the Frink Farm to the list. The committee must determine that the project meets all of the criteria laid out in the law to issue a certificate to build the project. It reached consensus on the first one on Wednesday agreeing that Eversource has adequate financial, technical, and managerial capability to build the project. On Thursday, the committee agreed that the project won’t have an unreasonable adverse effect on aesthetics, air quality, or historic sites before adjourning. It must also find the project won’t interfere with the orderly development of the region, that it will not have an unreasonable adverse effect on the natural environment, public health and safety, and that it will serve the public interest. On Thursday, Fitzgerald said the town of Newington wants more of the line buried. Committee Member Christopher Way said he was sympathetic with the request for more line burial, but questioned whether that could be added as a condition to build without denying the project. Way is the designee for the state Division of Economic Development. The committee ultimately decided that increasing burial of the line would change the project in ways that haven’t been studied. Weathersby said she would prefer burial of the line, “but that’s not what’s before us,” noting the committee was not inclined to require more underground line to mitigate visual impact. The committee will continue deliberations on Dec. 3, 6, 7 and 10 at 49 at Donovan St. in Concord. The committee has already heard 17 days of testimony and read volumes of pre-filed testimony. They are not taking more testimony, but are meeting publicly, discussing the testimony trying to reach agreement on the criteria set out in the law. Quinlan, who has been present at deliberations both days, also addressed the need for the project and the possibility of rolling blackouts without it during a break. “Essentially we are out of transmission capacity. So, under certain conditions, if we don’t build a project such as the Seacoast Reliability Project, you can have a situation where customer demand exceeds the ability of the grid to deliver that energy and rolling blackouts are a way to make sure the grid remains stable and doesn’t collapse,” Quinlan said. “That is something as grid operators we never want to see happen,” Quinlan said.